This seafood entree is coconut sweet and a breeze to make. If you like Coconut Shrimp then you will love my Coconut Crusted Fish. And you don't need to deep fry it, just saute in a little oil until lightly browned. If you have a package of shredded coconut left over from my Coconut Rice, or Cranberry, Orange and Coconut Cookies, then my latest chintzy recipe will use up the rest. If the opened coconut flake has dried out from sitting in the refrigerator a couple of months, then add a teaspoon of water, mix well and let it moisten for a few minutes. 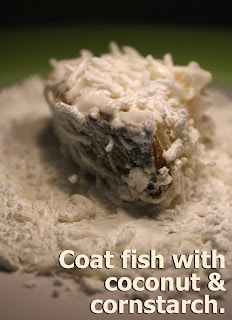 Sauteing fish coated with shredded coconut flakes makes any cheap frozen fish fillet sweetly delectable. It is best to go with a firmer fish (I used shark) like: salmon, mahi mahi, wahoo, tuna, cod and tilapia. Many markets often sell 4-6 ounce packages of fish, in their frozen deli bins, for around a dollar - this is perfect for one serving. Of course, this recipe is great with locally fresh caught fish. 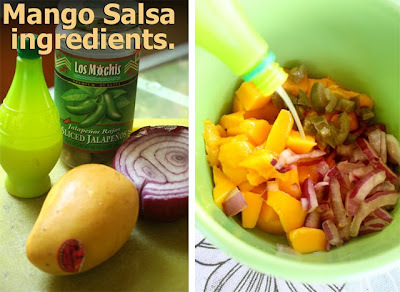 To go with this island themed dish I made a budget, fruity and spicy, salsa using mango, onion, jalapeno and lime juice. However, any salsa you have on hand would go with my entree. And if mangos are too hard to get then use ripe and peeled peaches. Once you try my Coconut Crusted Fish you will be hooked ! 4 to 6 oz. fish fillet(s) for 99 cents - defrosted and drained of water. Any fish you have on hand will work. 1/4 cup coconut - shredded from package. 3 tablespoons of cornstarch or flour. 4 tablespoons of oil for sauteing - start with 2, then add more as needed during sauteing. 1 mango - peeled and diced. Okay to substitute a ripe peach. 1/4 cup of chopped onion - red, white or yellow. Juice of a lime or lemon - or 2 tablespoons from a jar. Jalapeno - to desired hotness, about a teaspoon, chopped. Mix well: lemon or lime juice, chopped mango, onion and jalapeno (add a little jalapeno at a time and taste for desired heat). Heat 2 tablespoons of oil in a pan over medium/low heat. Use defrosted fish and drain fillet(s). On a flat plate mix coconut, cornstarch (or flour), and season with salt and pepper. Coat fish well on all sides and place in hot saute pan. Let fish cook on one side without turning - look at bottom of fish and wait until edges brown, about 3-5 minutes. Add more oil if needed, then turn fish to cook the other side a few minutes more (if fillets are thick, then you might want to also cook sides to take out any raw coating taste). Depending on thickness of fish, it's done when firm to the touch. 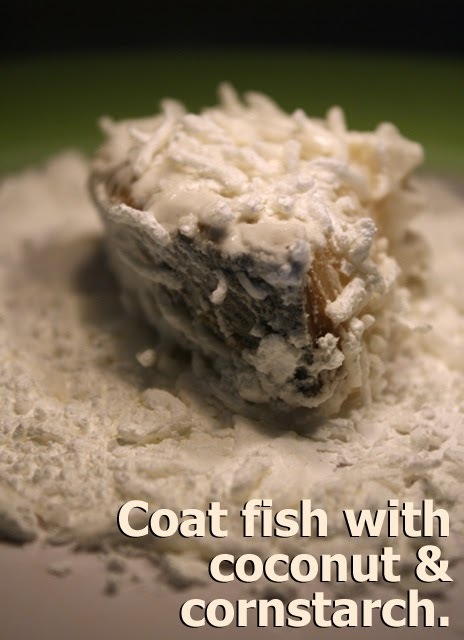 If some of the browning coconut coating comes off, just place it on the fish when done. Serve topped with Mango Salsa. I do love coconut shrimp so I bet I'll love this too. Must try soon. I'm thinking of adding a twist-- some Indian curry spices which are always good with the sweetness of coconut....though it sounds perfects as is. I love coconut. 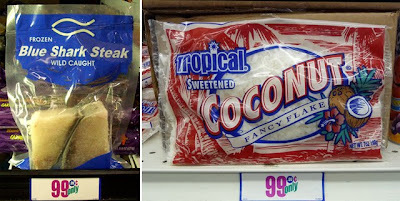 Coconut and seafood are awesome. You can also try coconut with prawns and spices like turmeric and paprika. Divine! Thanks for sharing more recipes! I was inspired by the squash and zucchini stew to make my own vegan stew with my organic veges. 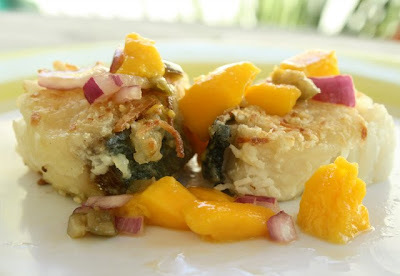 I'm not interested in Coconut Crusted anything, but I am so excited to have found this blog! (YouTube, looking for a donut recipe). Love your POV, your style, your eye for the original... Great work. My day was shot -- now it's not. Thank YOU. The salsa looks so delicious. I really don't like coconut that much but this is worth a try. I just discovered your wonderful blog! This dish looks amazing! I've linked to this post on my Facebook page.